Purchasing beads for use in your jewelry designs can, at times, be limiting. By learning new methods for creating your own beads, you can expand your designs to include the exact color, size and style of bead you envisioned. Additionally, rolled paper beads are both lightweight and inexpensive to create. With the wide variety of decorative scrapbook paper on the market, rolled paper beads are easy to customize to your design specifications. 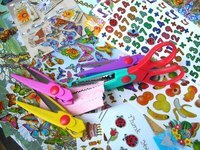 Measure and cut strips of paper 4 to 5 inches long and 1 1/2 to 2 inches wide. Cut each side of the paper strips at an angle to form a elongated triangle. Varying the shape of the triangle will change the final shape of your rolled beads. Lightly coat the back side of each paper strip with craft glue, leaving 1/2 inch of paper dry at the widest end of the strip. Roll the paper strip around your chopstick or drinking straw, beginning from the dry area of each paper strip. Hold the paper triangle tip in place for 60 seconds to allow the glue to set. Coat the outside surface of your paper beads with a clear-drying craft glue for a glossy finish. Allow the beads to dry for 24 hours before stringing. Cut a length of beading wire about 4 inches longer than you want your necklace or bracelet. A necklace that dips just below the collar bone should measure between 17 and 19 inches, while an average bracelet should be 7 to 8 inches long. Thread a crimp bead onto the wire and run the wire through the loop on one side of the clasp. Bring the wire tail back through the crimp bead and pull the loop tight. Crimp the bead in place with crimping pliers. String your rolled paper beads onto the beading wire until the length is about 1/2 inch shorter than you want your necklace or bracelet. Thread a crimp bead onto the wire after your final paper bead and bring the wire end through the hole on the other side of the clasp. Thread the wire end back through the crimp bead as well as 1 to 2 paper beads and crimp in place. Attach multiple strands of paper beads to the same clasp for a voluminous necklace or bracelet. Stamp your paper with acrylic paint or ink prior to rolling your beads to create your own design. Protect your work surface with newspaper while working with craft glue. Make beautiful hand-rolled paper beads to create unique statement jewelry from specialty papers and recycled materials.